Unlike most BCAA’s AMINO SWITCH contains all 9 EAA’s at the Perfect Human Ratio. This ratio is designed to help SWITCH ON muscle recovery and SWITCH OFF muscle breakdown. 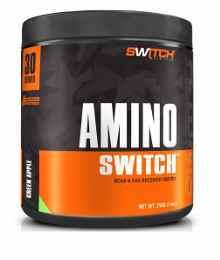 In fact, 1 serve of AMINO SWITCH is equal to 30g of WPI but much faster absorbed and with less digestive issues.